Enjoy by 10/11/2013 printed on bottle. Head is a finger of translucent foam. Body is urine yellow. Some lace noted. The nose is grapefruit, mango, mandarin orange and a hint of pine. Upon deep inspection, hints of caramel is found. The taste seems simpler than the nose. 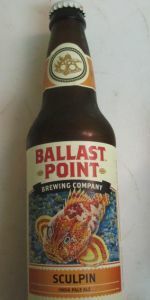 It starts off with grapefruit, has a hint of caramel then delves into pine with a bit of mandarin orange. A dash of vanilla is noted as the beer warms. The mouthfeel is what really makes this beer. I want more. Somehow they sculpted this beer to wash perfectly over the tongue and leave you wanting more. Overall, I tried to not let the hype influence my judgement on this beer. It certainly was something special though, especially in a style I happen to drink often. I will enjoy this again soon.